It's officially here...the beginning of the holiday season. This week of Thanksgiving is a prelude to what's just ahead and in some ways this celebration is even more special than Christmas. It just seems this one hasn't been twisted into something it was never meant to be. Family, food and thankfulness. Kind of cuts to the heart of it doesn't it. I'm not hosting turkey dinner this year so this will most likely be my last pumpkin inspired post and recipe for a while. I tried these ginger cupcakes from Ina Garten this week. 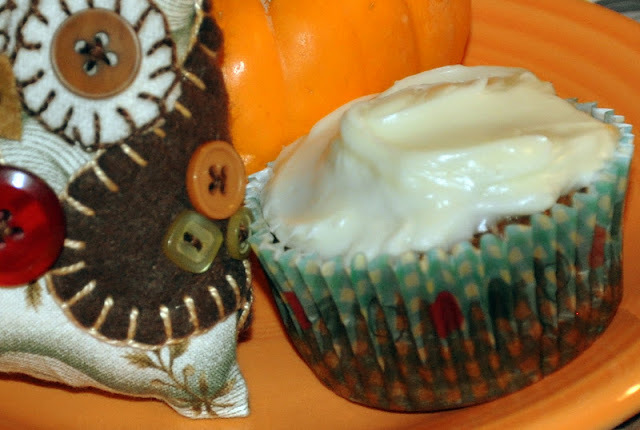 The cream cheese frosting with orange zest is delicious. Not only is it time to say goodbye to autumn and hello to winter but for me it's time to say goodbye to my dining room table until the decorations have all been put up and the Christmas tree trimmed. My family knows this, they've learned not to expect to actually eat at the table for the next week or so. But come December 1st, it will all have been worth it. That owl is awfully cute. Did you make it? I caught an episode of Ina's Saturday morning and she made those cupcakes. It looked awfully good. She also made a stuffed turkey breast that looked delicious. Have fun with the decorating. Take care. That's funny. We can't eat at the table this week either since it is set for Thanksgiving. We still have the counter, but usually just eat in our chair in the family room. Love your cute owl. 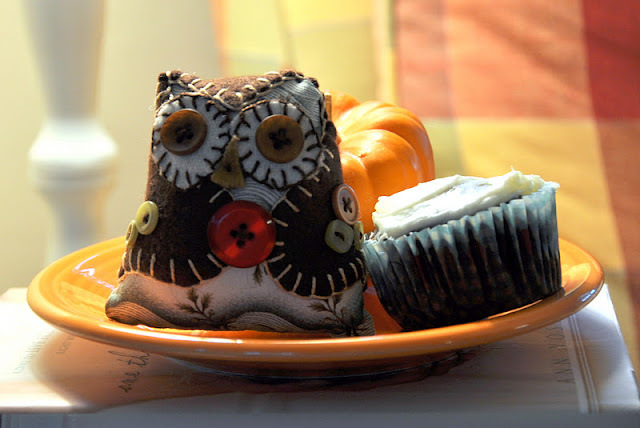 Have a Happy Thanksgiving, and the little owl is just so cute. Did you make it? I love that little owl. Just darling. Have a blessed day if I haven't said so before. It is a day which we reflect on our Thankfulness the most and I think that is truly most important. Those looks delicious Patty. And I love the little owl!! My daughter brought me home a beauiful cookbook from San Diego Hotel Del, and it has a similar recipe to Ina's in there that I am dying to try. Do you know what the date was that we were to try to get together, us gals? I just love your posts Patty, you make me smile every time. I will be setting my table tomorrow.....everyone knows they need to steer clear of it until Thursday. Oh how I love all the preparation for that beloved meal. Looking forward to our get-together on the 3rd my dear blog sister. we are going to be saying goodbye to Fall. But, that just means that we get to enjoy all the Christmas season has to offer. Most importantly, we get to celebrate the birth of Christ. Hope you have a wonderful week, and a great Thanksgiving!! Swwet little owl! Looking forward to see your Christmas decor! I love your little owl too! I've been really bad about clearing my dining room table lately too MDH and I have been eating. in front of the tube. I look forward to seeing your Christmas decorating.